Pattern Is Movement opens up the musical framework, embracing R&B while resisting the compartmentalization that limits many of the band's contemporaries. On August 20, 1972, as part of his invocation at the Wattstax festival, Jesse Jackson said, "Today on this program you will hear gospel and rhythm and blues and jazz. All those are just labels. We know that music is music…" It's a quote that has been upheld within popular culture of decades past, most notably within the documentary Wattstax (1973) and by Primal Scream in Screamadelica single "Come Together" (1990). These days, however, the phrase is like an irrecoverable ideal. This way of perceiving music and its place within the culture seems impossible to reconcile with contemporary critics' preoccupation with musical microgenres. The staggering number of niches created by writers and commenters to "distinguish" musical acts is ultimately binding. If a band plays along and tailors itself to a category, then its fortunes are likely tied to the shelf life of that category. In this way, the attention to microgenres is another form of destroying work in progress, occurring in tandem with the tendency of critics to build up bands, maximize their usefulness, and then thrust them aside. For many artists trying to establish identities, the speed and ravenousness of online publication ensure that there is no due process. The attention given can quickly be revoked, often on grounds (and generic contexts) artists never agreed to in the first place. The sounds of their voices get lost in the exchange. 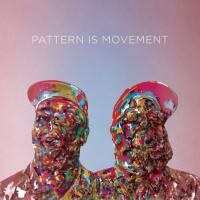 Pattern Is Movement is a band that seems to largely avoid both the act of naming and the hype cycle. Nearly two years ago, the band commented publicly on its new album with a statement that read in part "we have not made a hip-hop record, however, we definitely tapped into our R&B roots for this record." That's as far as the band members went to establish context. And then the album in question, which was being mastered at the time of that May 2012 statement, took a long and not publicly documented path towards being released. Regardless of how intentionally the band members swam against the tide of the way music lives now, their approach has proven to be a good fit for bringing Pattern Is Movement into the world. It is very difficult to describe what the album is, but there's no mistaking what it does. Pattern Is Movement opens up the musical framework, embracing rhythm and blues while resisting the compartmentalization that limits many of the band's contemporaries. Yes, the album is representative of a generation accustomed to hip-hop as the dominant, chart-topping musical form. But Pattern Is Movement never once feels appropriative. Wide as the album's palette is, the compositional choices are specific and judiciously executed. These qualities reinforce the freedom that comes from respecting musical boundaries as an avenue towards bending/exploring those very limits. "River" begins the album with a rudimentary keyboard melody and reverberating drums, joined by a variety of low-end activity. This focus on low end is characteristic of the album as a whole. Bass guitar and bass tones are crucial to the album's expressive effects throughout. The interplay between Andrew Thiboldeaux's melodious voice and the rhythm section is a hallmark of the band Pattern Is Movement has evolved into, and Pattern Is Movement continues to break ground in that direction. Though 2008's All Together overflowed with memorable melodies, its compositions and production didn't plumb the sort of dynamic combinations found on the new album. The only drawback of "River" is that the players/producers choose to strip away each element one by one in the song's final half minute. It's an unnecessary disassembly of a mighty assemblage. Romantic in its lyrical approach, "Climb to Me" is more focused than "River", and arguably stronger for it. A violin line drops in and out, bearing some resemblance to the memory of "The Last Time"/"Bittersweet Symphony" but ultimately serving as a counterpoint to the deep rhythmic groove that dominates the song. By the end of the song, when drummer Chris Ward wraps his beat around the violin, the result is like an impromptu sample flip. It's one of several moments on the album that reveal and respect the influence of hip-hop. The technique carries through to the next track "Rum", and this time a trumpet, French horn and clarinet join the proceedings. One third of the way through the song, the drums fall away and the horn section blooms for a sublime interlude. When the drums and vocals return and the tempo quickens, it's difficult to remember how the song began, but it hardly matters because the present momentum is irresistible. This effortless shape-shifting is the essence of Pattern Is Movement. The middle of the album is a showcase for Thiboldeaux, as his voice is a unifying element across three soulful tracks that reach in stylistically different directions. On the verse of "Suckling", the bass and keys pulsate like they're primed to introduce R. Kelly. In contrast to the bounce of "Suckling", "Gone My Love" operates without a proper beat until midway. The song's first half features full-throated lead vocals that receive a mournful response of "gone my love" from deep within the mix. This is a composition in the style of "All is Full of Love", and it's an excellent way to ready the listener for the album's second half. "Let's Be Done" is an exercise in tension and relaxation. Two lyrical phrases ("Let's be done" and "Like dragging an ox through the water") correspond to the conflict within the musical progression. The sense of unease that is created provides a transition into "Make it Right," a song that starts with a likeness to "A Beautiful Mine"/"Autumn Leaves". In total, the song has much in common with the approach of the similarly unclassifiable (and nearly ten band member-strong) Jaga Jazzist. "Make it Right" is certainly the busiest song on the album, with Ward firing on all cylinders and valuable assistance from Josh Anderson on trumpet and Trish Giangiulio on French horn. The two songs that close Pattern Is Movement will be familiar to listeners who have followed the band's progress towards this release. "Light of the World" is a remixed or re-recorded version of a song of the same name that was released on a tour-only EP in 2010. Compared to the earlier release, the drums are nowhere near as present in the current version of the song. However, the drums' relative absence allows for a greater appreciation of the vocal tracks and their intricacies. The song's title is an apparent reference to a phrase from the gospels of Matthew and John, but it is used here to signal some kind of positive transformation or impact of non-specific origin. Also reaching back into the band's history is "Wonderful", which was used to promote an April 2013 "album screening" event as part of the Tuesday Tune-Out series at PhilaMOCA. In the promotional video for the event, "Wonderful" was paired with images from Paul Thomas Anderson's 2007 film There Will Be Blood. Attendees of the live event heard the full album set to scenes from the film. While there was no precise connection between the music and the footage, the combination of the two was effective in discovering shared moments of tension and release. Thiboldeaux's repeated phrase, "Toil, my friend, oh toil" and the French horn contribution by Adam Lesnick rank among the most memorable elements of the album. Though the song shares a powerful resonance with Anderson's film, the images aren't necessary to appreciating the song. And in the style of opening number "River", the instruments of "Wonderful" fall away one by one towards the song's end, leaving the horn as the lone musical voice. This time, however, the technique contributes to a feeling of isolation. Indeed, Pattern Is Movement is over before the listener is ready to be left alone. Not since Kid A has an album used its last song to create such an intense engagement with subsequent silence. In recent years, a lot of acts associated with rock music have tried to fit some increased measures of rhythm and blues into their approaches. Perhaps it's fair to say the attempt never really went away but merely became more active since Sasha Frere-Jones (in)famously claimed in 2007 that "indie rock lost its soul". Just last year, Chart Attack's Jordan Darville called out Arcade Fire and its Reflektor campaign for taking advantage of and/or falling victim to "this overarching perspective of Caribbean islands being resources for awakening of white souls." Pattern Is Movement risks no such controversy because its soulfulness isn't yoked to a brand or marketing strategy. For Pattern Is Movement, music is music.